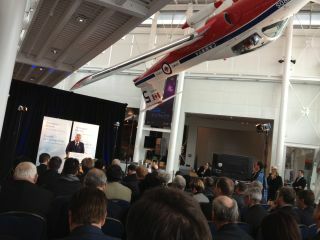 Aerospace review panel chair David Emerson speaks at the press conference at the Canada Aviation and Space Museum in Ottawa, Canada. The Canadian Space Agency is suffering from "ad hocery" because the government has no clear future plans for space, according to a Canadian aerospace review panel. The Canadian Space Agency, or CSA, needs yearly, minister-level reviews of its activities as well as some high-level advisory boards that can advise bureaucrats on space activities, the panel said. To better focus the CSA's work, the panel said that the agency should hand off contracting responsibility to the Public Works department. Also, competition for contracts should be more open to foreign companies who pledge to include Canadian content. The recommendations formed part of a two-volume report released Thursday (Nov. 29). It is now up to the ruling Conservative party to determine how many of the panel's suggestions it will implement, if any. The proposed changes would widen the field of companies receiving government funding for space activities, panel chair David Emerson told SPACE.com. Canada's space base is overly dependent on a few firms, such as Canadarm robotic arm manufacturer MacDonald, Dettwiler and Associates, he added. The government-appointed panel was charged with figuring out how to keep Canadian aerospace from falling behind China, Russia and other countries. Shifting contracting responsibility and otherwise refocusing the CSA would free up $5 million a year for the agency's technology development programs, the panel said. The panel report is the preliminary step in Canada's first effort at putting an overarching plan in place for the CSA in more than a decade. In that time, the CSA's budget has declined and prominent projects, such as the Radarsat satellite constellation intended to monitor the borders, have languished due to a lack of attention, the panel suggested. This finding echoes complaints from MDA and another contracting company, Com Dev, which have both said the government's funding delays forced them to lay off employees working on space projects. Aerospace review panel chair David Emerson speaks with media at the Canada Aviation and Space Museum in Ottawa, Canada. "If our recommendations were implemented, I don't think the same problems with Radarsat would have happened," Emerson said. Because Canada's government is cutting back its spending to try to balance the budget, the panel aimed to make its recommendations revenue-neutral. Thus, under the panel's recommendations, the CSA can count on no increased funding in coming years, and will need to become more streamlined to ramp up its activities. However, the panel called for CSA's budget to be stabilized for the next decade so that companies can better predict how much money is available for robotics, satellites and other projects. Funding for major initiatives must come from several sources, the panel added. Besides the CSA, other federal departments with an interest in space, such as defense or environment agencies, could chip in. Additionally, the government could consider measures such as renting out research space at its facilities, or forming private-public partnerships, to leverage more money from the private sector. The panel also recommended that Canada encourage the nation's commercial space industry. Panel members pointed to the success of Virgin Galactic and Solaren Corp., a U.S. solar power satellite system manufacturer, as examples of firms "on the rise." However, the proposals to increase commercial space activity were modest. The panel suggested measures such as renting out government lab space, and reducing the tax burden on investors in commercial mining activities that use satellites. The panel also proposed regulatory changes to increase the opportunities to companies interested in suborbital and orbital launches, high-altitude tests and human spaceflight, but did not offer any details. Ultimately, Emerson said he was optimistic the government would implement most of the report's recommendations. He said his prime consideration was to make all of the report doable, "not just to gather dust on a shelf."